Photo by Bob Buechner, 2014 | Click image to enlarge. Flooding at the intersection of Crown Valley Road and Cory Avenue. 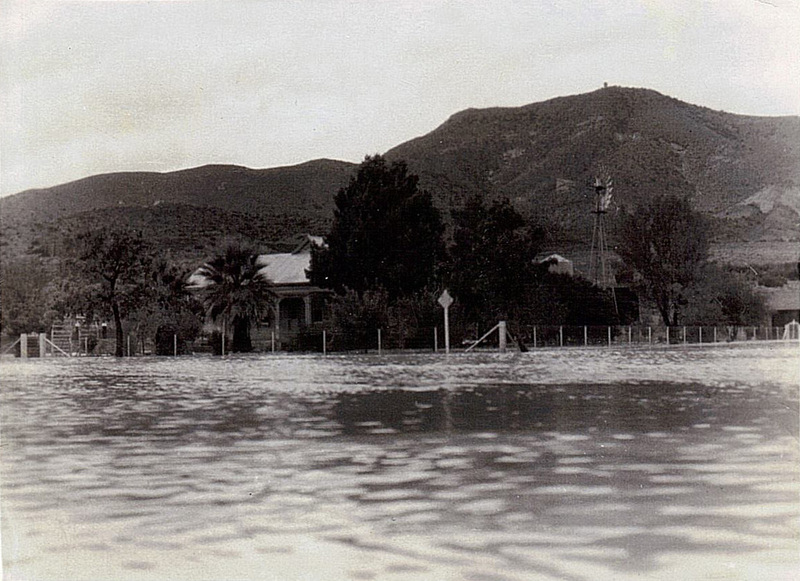 Most likely the Great Flood of March 2, 1938. The view is to the southwest toward the former R.E. Nickel home — the Freese home, in 1938 — at what is now 31823 Crown Valley (SW corner of Crown Valley and Cory). The photographer is standing at the northeast corner. One way to estimate the date is to consider the size of the two palm trees in front of the house. The were knee-high to a tadpole when Nickel planted them in the 1890s. Compare their height in the 2014 photograph. In the black-and-white photo they're somewhere in between. Another way to identify this image is by comparing it to a photograph on page 301 of Meryl Adams' 1988 book, "Heritage Happenings." The photograph in the book shows the Acton Hotel in the Great Flood of 1938. Except for the camera being pointed to the right (north) of the image above, the conditions — the weather, the level of water in the road — are identical. According to Meryl Adams (1988:65), Richard E. Nickel — the so-called "Father of Acton" and the town's second permanent resident, having married the daughter of its first — started construction on this house for his young family in 1895 and completed it in 1896. However, this might be a bit late. According to L.A. County Assessor records, the 1,216-square-foot, 3-plus-1 home has a construction date of 1891. Nickel rented out the home when he moved to the San Francisco area at the beginning of the 20th Century. At the time this photograph was shot, the old Nickel place was the Freese residence. According to Adams, Albert W. Freese arrived in Acton in 1903 and served as a Southern Pacific Railroad section foreman for 32 years. In 1935 — apparently upon his retirement — Albert and his wife Annie bought the Nickel home. Annie Freese died just five years later in 1940, followed by Albert in 1958. "Mr. Freese put in the 18-inch retainer wall for flood protection, and also put the white stucco on the original house," Adams writes (1988:391). We're not sure if there's a retaining wall in this photograph, but if there isn't, you might guess what prompted him to build one. (It can be seen in the 2014 color photograph.) "The home was noted for the roses maintained by Mr. Freese," Adams adds. About the contributor. Don Milburn received the original photograph from his mother, Marie Milburn. Marie and her husband Jack Milburn had come to Acton in the 1940s and lived at the John LaBadie ranch on Hubbard Road. Don remembers that "Grampa John" LaBadie's morning routine was to "hang the outgoing mail bag onto mast by the railroad tracks. The Southern Pacific train would toss the incoming Acton mail bag onto the ground and a mechanical arm would grab the outgoing mail bag and haul it into the train. It was great fun for us kids to chase down the mailbag for Grampa John and drag it to his car for him." 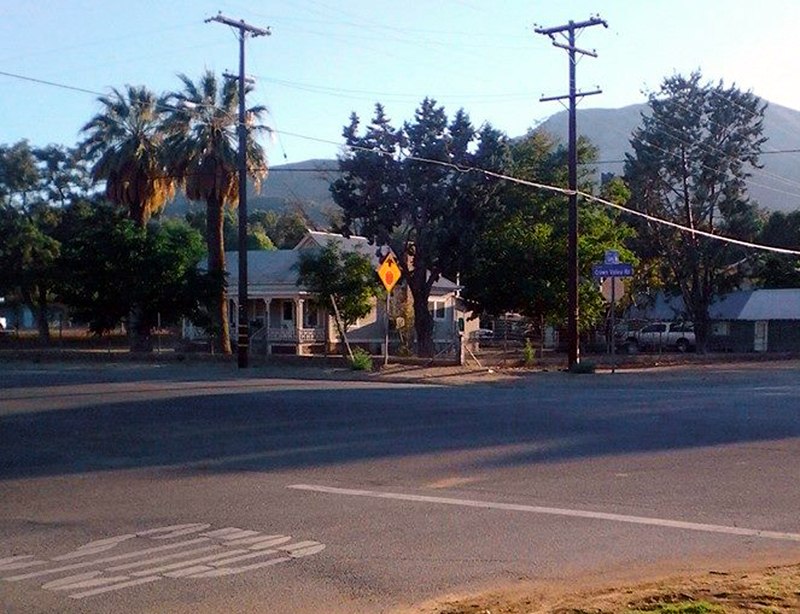 In 1950 the Milburns moved to a house at Crown Valley and Soledad Canyon Road. Says Don: "Dad worked for L.A. Country at Acton Rehab center in the mornings and remodeled houses in the afternoons and evenings. Mom worked at the Acton school for many years and then worked at Acton Rehab for a long time. Both mom and dad retired from Acton Rehab." 1. See Meryl Adams 1988:395. About the Great Flood of 1938. Surpassing the St. Francis Flood of 1928 in scope — if not in deaths — the Great Flood (aka Los Angeles Flood) of 1938 hit the greater Los Angeles area hardest overnight on March 1-2. By the time the water receded, 5,601 buildings had been destroyed and 113 to 115 Southland residents were killed. DO3801: 19200 dpi jpeg from smaller jpeg | Online image only.